At the heart of whiskey is a distilled fermented grain brew which is often referred to as “distiller’s beer”. This “beer” often isn’t very palatable on its own and is custom designed to be distilled. Clint Potter and Tim Obert have taken this concept to the next level with Seven Stills of SF, built around the idea of developing bottle-ready craft beer recipes which are then distilled into whiskey. Distilling a bottle-ready beer has been done before with some nice results (like Charbay’s Double & Twisted), but it’s often a difficult, complicated, and expensive endeavor. For Seven Stills Chocasmoke Whiskey, the Seven Stills team created a chocolate oatmeal stout made with added peat smoke malt. 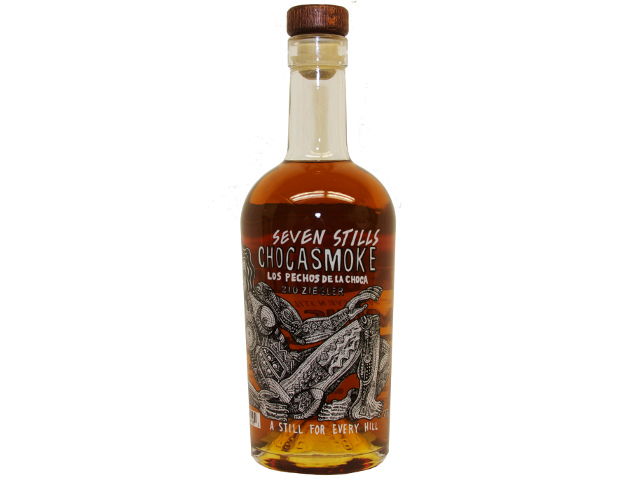 Seven Stills Chocasmoke Whiskey (47% ABV / 94 proof, $54.99 for 375 ml) – light amber in color, the nose of Chocasmoke is lead by raw, unseasoned oak, illustrating that Chocasmoke was aged in small barrels. Small barrels consistently add undesirable tannins and wood-based chemicals to the mix that larger barrels often do not. With Chocasmoke these oak elements dominate the nose. Once you get beyond the unseasoned oak, there’s a fairly deep and rich honey note. This is accompanied by dark chocolate, clove, and a hint of smoke. The unseasoned oak note leads the entry but it’s not as overbearing as it is in the nose. Underneath the young oak note is salted caramel, black pepper, and honey. In the midpalate, the youth of this whiskey really comes out with a character that still feels connected to unaged whiskey or white dog. There’s a supreme lack of depth, complexity, and flavor in the midpalate – it’s a little bit of a muddled mess. It’s not until the finish where we get to the real promise of Chocasmoke. Here there’s the essence of that deep and wonderful stout as well as a touch of the peat smoke which complements it very well. The finish also shows off the youth of this whiskey as it’s both quite edgy and dry. There are some great ideas at work with Chocasmoke, but the shortened aging in small barrels yet again handicaps what could be a promising whiskey. There simply isn’t a replacement for using larger, properly seasoned barrels and giving whiskey the time it needs to mature. We understand the lifeblood and expense that goes into making a craft whiskey, but Seven Stills has priced this one way out of the market. At $54.99 for 375ml, it’s the equivalent of over $100 per 750 ml. Given some of the truly magical whiskeys you can buy at that price, it’s hard to recommend this one. 400 bottles of Chocasmoke Whiskey were produced and are for sale mostly in California. The Seven Stills duo plans seven unique whiskey releases, each based on a craft beer base and honoring each one of the seven hills of San Francisco. We hope they’ll move to bigger barrels and give their whiskey more time to mature. A chocolate oatmeal stout with smoked malt could be the foundation of some pretty interesting whiskey, but that promise hasn’t been realized with Chocasmoke.